Elusive Quality, sire of Kentucky Derby winner Smarty Jones and Breeders' Cup Classic hero Raven's Pass, has been retired from stud duties at Jonabell Farm in Kentucky. The 24-year-old son of Gone West became the second stallion to stand for Sheikh Mohammed in America when retired in 1999. Elusive Quality had broken the 7f track record at Gulfstream Park, at 1:20, and also set a world mark for a turf mile in the G3 Poker Handicap at Belmont, in 1:31.63. 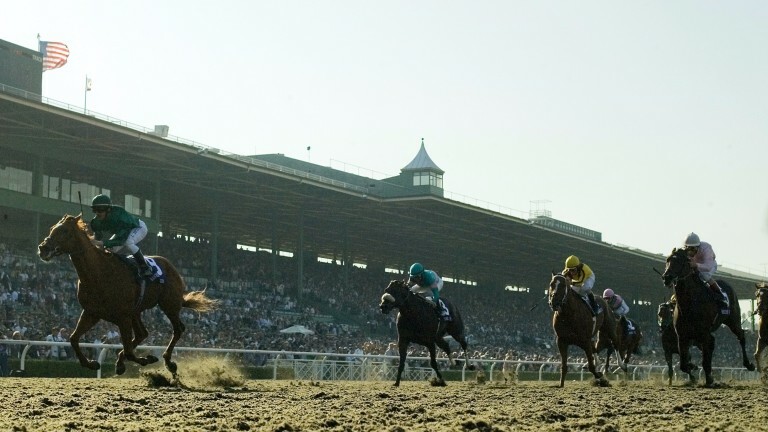 He started at a fee of $10,000 and promptly produced Group 1 winner Elusive City from his first crop, and Smarty Jones from his second - along with Breeders' Cup Filly and Mare Sprint winner Maryfield. By 2005 his fee had soared to $100,000. His other top performers include two promising young sires in Quality Road, whose daughter Abel Tasman won the Kentucky Oaks this year and Sepoy, product of a shuttling stint to Australia. "Elusive Quality has had two great careers but it’s the right time for him just to relax and take it easy here at Jonabell," said Dan Pride, COO of Godolphin in America. "But given the success of his current sons at stud, along with the production from his daughters, his will certainly be a legacy that will last for quite some time. "He was the type of sire that could get you any kind of horse - dirt, turf, synthetic, and they could go short, middle or long. He truly was a very special and versatile sire." Elusive Quality has sired a total of 127 black type winners and 51 Graded / Group winners, including 14 at the highest level. As a broodmare sire, he had his 61st black type winners only on Tuesday when Sound And Silence won the Windsor Castle Stakes at Royal Ascot.